Movies allow us to be lost in a different or we can see the virtual world. Most of the movies are now well determined to entertain the audience not only with the air of the romance but also with the twist of an ultimate suspense thriller. The directors always intent to follow one particular step i.e. to bind the audience with the plot for the entire time without letting them get bored. But there are some movies which have not shocked them but have also surprised them with the sudden twist at the end. The movie Shutter Island stands as one of the best examples of matching the same feature. The ending of the movie not only awestruck the audience but also let the audience in ultimate shock of knowing the truth. 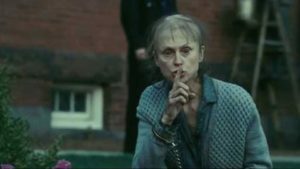 What Was The Movie Shutter Island All About? It is neo-noir Psychological thriller and is based on the novel of the same name. The movie depicts the psychological conditions of the protagonist. The movie stars Leonardo DiCaprio as a U.S Marshal Edward Teddy, Mark Ruffalo as Chuck Aule, Ben Kingsley as Dr. John Cawley. The movie starts with a U.S Marshal Teddy with his new partner Chuck have come to visit the Ashecliffe Hospital in order to investigate the patient Rachel Solando, who was held and treated for killing her three children by drowning. But in the process of the investigation, some more comes up related to the background of the hospital status which later not only creates a kind of doubt on the hospital staff but also about the formats of disappearance case. What Was The Most Shocking Part Of This Movie? The movie was not only an analysis of a psychiatric patient but also to how far they can be lost in hallucinations. This movie was successful in the world and received worldwide applause for the role played by DiCaprio. The movie moves up with the investigation of the patients Rachel missing’s then slowly page by page lots of issues comes up and later it is found that hospital staffs are involved in some kind of secret treatment and which might have gone wrong and might have killed the patient. But in the later period, the most of these issues actually seems to be false. Because it is in the complete end of this movie it is known that the Teddy himself is the actual culprit and for his treatment, all this set up was made to reveal his own fate of how he killed manic depressive wife because of killing her own daughters. How Was The Movie Perceived By The Critics? This movie was actually some of the extraordinary movies among the lists of other such famous movies. No matter what the movie was awaited by the audience and everyone wanted to know exactly what happened with the missing patient but the patient himself was the U.S marshal definitely added another flavor of twist with a very different classic end. The movie was also said to be a clear representation of the people who are suffering such disorders.